Día de los Muertos: A Community Exhibit Honoring Day of the Dead, will be on display at the Grand Rapids Public Library’s downtown Main Branch October 28-November 1. 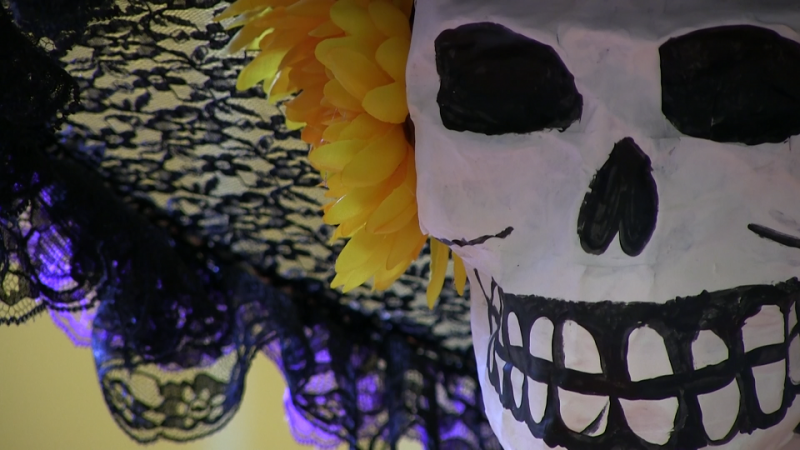 Day of the Dead | Grand Rapids Public Library from Way Creative on Vimeo. This Saturday, October 28 through Wednesday, November 1, the downtown branch of the Grand Rapids Public Library (GRPL) will celebrate the Mexican holiday Día de los Muertos. Día de los Muertos, or Day of the Dead, honors family and friends who have died. The celebration also includes a Family Day event this Sunday, October 29 from 1-4:30 p.m.
“The altars are very customized to the person that they’re going to honor, but there are different items that do symbolize the same thing for every altar,” says Paola Mendivil, Catering Coordinator for El Granjero Mexican Grill and Día de los Muertos food vendor. 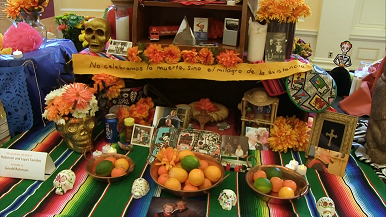 Altars built by community members and local artists will be on display at GRPL during this time. Altars are decorated with flowers, candles, photos of the deceased, as well as food, drinks, and personal items from their lives. Skeletons and sugar skull candies are also used to decorate the altars. “These skulls are often depicted with a smile on their face, or they are laughing…to remind us that while we are here, we should try to enjoy life,” says Stark. Although the holiday celebrates those who have died, it is a time of celebration and joy for families and friends. Rather than sadness, it’s a time to share stories and memories of loved ones. Día de los Muertos is celebrated in Mexico and in other Latino countries, as well as here in the United States. There are many ways to celebrate the holiday, and different regions have different customs. Traditionally, in Mexico, families gather to visit cemeteries and clean the gravesites of their ancestors. They bring food, flowers, skull candies, and more to honor and celebrate their loved ones. This Sunday’s Family Day event has activities for all ages to enjoy, including food, music by Gabriel Estrada III, bilingual story time, face painting, crafts, and of course, a celebration of the altars. You can learn more at the Día de los Muertos: Family Day Facebook event page. School groups will tour and learn about the altars during the celebration, and the public is also welcome to come view the altars through November 1. GRPL began celebrating Día de los Muertos as a way to engage the Latino population in our community, as well as educate community members who may not be familiar with the holiday. “It’s an access point for people who might not otherwise interact with people who aren’t like them,” says Steffanie Rosalez, Program Director for Cook Arts Center at Grandville Avenue Arts & Humanities. 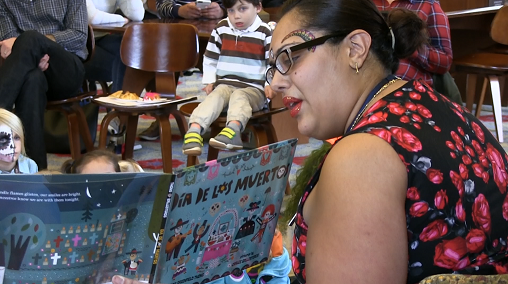 “Here in our community, going to the library means that you’re going to learn, you’re going to explore, you can make friends, that you can enjoy and have an experience,” says Mendivil. Día de los Muertos is free and open to the public. Visit www.grpl.org/dayofthedead/ for more details. Día de los Muertos is sponsored by the Grand Rapids Public Library Foundation. The Grand Rapids Public Library Foundation provides fundraising and advocacy support for GRPL. To learn more about the events and programs sponsored by the Foundation, and how you can donate to help support events like Día de los Muertos, visit www.grplfoundation.org.